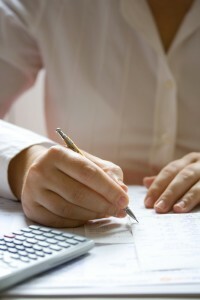 We are a small accountancy practise that has been established for over 10 years. We aim to provide you, the client, with a high standard of financial and business services. Louise Rankin set up Alleviate Accountancy after working in the industry for over 25 years and realising she can offer a unique accountancy service. Some of her clients found other accountancy firms “too busy to speak on the phone” or “took too long to respond to emails”, some clients were “too scared to ring with a simple question” in case they received a charge for the phone call. At Alleviate Accountancy we pride ourselves on our personal service to our clients, we know each one individually, and you are not a number! We charge a set annual or monthly fee which ever the client prefers and this is inclusive of telephone calls, emails and meetings, if there is an additional charge for extra services this will be agreed with the clients before the work commences. Louise qualified with the AAT (Association of Accounting Technicians) in 2000.